The textures have it! 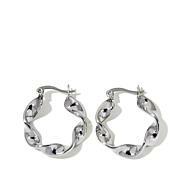 These contemporary hoops sparkle every time you move your head. Slip them on to finish everything in your closet from jeans and a sweater to your favorite LBD. The styling, silvertone color and honeycomb texturing spell a win, win, win for timeless styling. 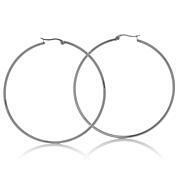 The perfect size hoop for day wear and an evening out! Lightweight and beautiful texture. Love the size and texture of these. Awesome earrings and they won't turn color! Finally found a bold enough pattern to hold its own--not for you if you are faint at heart--this is for the statement girl who likes the attention on her. 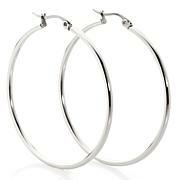 These hoops are well made and lightweight. I love the design on the sides which sets it apart from my other hoops. Great gift for all ages. I really like these. They are not heavy although they are large hoops. A great addition to my Stately Steel collection.